So starting off you have all probably heard of this "Circle of fifths" thing. I thought it was a piece of crap when I first learnt it and couldn't get it at all. So I discovered an easier way to remember the sharps and flats, and it also helped me to understand the Circle of fifths, too. So, for the sharps, I'll name the keys in order of how many sharps there are. Now, to remember this, I used words for each Key letter and it became a story. This is the only story I've been able to make out of it, but if you're able to make one yourself, be my guest. 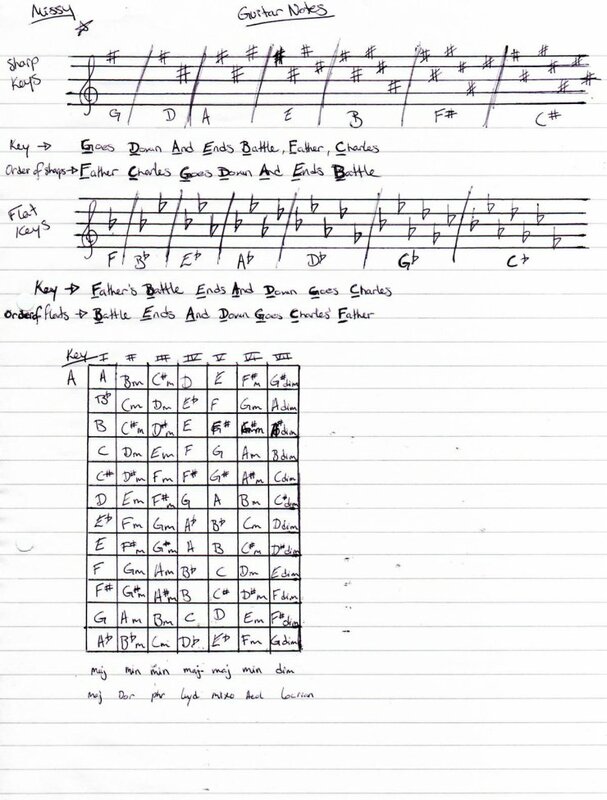 Just incase you don't get this, F# is the only sharp in the key of G.
F#, C# are the only two sharps in the key of D.
F#, C#, G# are the only sharps in the key of A. Pretty much the same thing for the Flats, too. Same thing with the sharps, Bb is the only flat in the key of F and so on. haha now that's a new one! Awesome. Thanks for that. I learned it as Fat Charlie Goes Down And Eats Breakfast (incidentally, from a fat teacher who was eating candy and drinking soda constantly), but I like Father ... Battle better since it can be reversed for the flats and it still makes sense as a sentence. I saw this same remembering device for the first time only a few days ago, so it's kinda cool to see it again. Yeah, I like how this one can be used for everything, exactly why I found it so easy. Though I'm glad you've also got something to remember it by. I found this really helpful. The only suggestion I have is that you specify the obvious so say there are 7 sharps in the key of C#. Dumb I know, but I did a double take when I read 7 sharps in the key of C.
An unrelated point I can't see anywhere else to post. Some of the links take me to pages where all I can see are pop up ads, and no way to get to the link. Maybe the links are broken or pages blank ? Would be useful to know. This looks like one of the most useful and accessible sources for me on the web! Both links also work for me, perhaps it was just a temporary glitch?